I live in a two Easter household. My family celebrates “western” Easter and my husband’s Greek family celebrates Eastern Orthodox Easter. That’s a whole lot of Easter for this non-religious woman. And while I hope this doesn’t offend anyone – for me, Easter’s more of a family holiday versus a holy day. On western Easter, my family gathers to enjoy an elaborate breakfast/brunch hosted by my cousin, Stacey (aka hostess-extraordinaire). She goes all out for a crowd of 14-16: eggs with and without cheese, bacon, sausage, hash browns, bagels, various kinds of muffins and breads. It’s all washed down with mimosas and then followed by a huge array of yummy sweet treats like cookies, cakes, assorted Easter candy, etc. Just thinking a bout it makes me hungry. But, this year was a little different. Knowing what sumptuous foods awaited me, I planned ahead and found a couple of recipes that enabled me to break bread with my family without breaking my healthy eating rhythm. The first one was a Tomato Basil Mozzarella Salad I found on a terrific recipe site called Savory Sweet Life (NOTE: I excluded the EVOO in this salad – just used balsamic vinegar). The second one, Curry Chicken Lettuce Cups, was on the Food Network site. The ingredients were healthy and it looked delicious. I figured it was worth a shot and decided to make it the night before the breakfast. Thought that was plenty of time for the flavors to mesh and had an added benefit of letting me sleep in a little later the next morning (sleep is my fav hobby). The original recipe called for mayo. I’m used to always having mayo and Miracle Whip Light on hand, so I didn’t check my fridge (DUH!). Lo and behold, mayo AND Miracle Whip are now such a minor players in our food lives that I didn’t know both brands expired – 3 and 5 months ago! Poor Greg was sent out at about 10pm to find some mayo (Walgreen’s, anyone?). After returning with two small jars of the precious cargo (both lowfat mayo AND Miracle Whip Light), I made the curry sauce with the light mayo, tasted it, and thought it was icky. There’s no better word for it. I just didn’t like it. Lowfat mayo made the sauce totally unappetizing. Time was running out (and so was my curry powder), so I made the sauce again but with Miracle Whip Light. Better, but still not quite right. I read a note on the recipe suggesting a drizzle of honey to add some sweetness. I didn’t want to add honey – feared it would be too sweet – but I caught sight of some honey mustard in the fridge. A teeny bit of sweet/tang sounded MUCH better. I threw a Hail Mary pass and added it to the second version of the sauce. Voila! After the late night mayo debacle…SUCCESS! Brought it to the breakfast. Greg, my dad, and I chowed down on it. The guys gave it two thumbs up and I enjoyed it, too. I promoted it to my permanent recipe collection. Fast forward to this morning. Looking for something easy to make that would produce enough leftovers for lunches for a couple of days, I remembered the curry chicken recipe and decided to give it another shot…with additional modifications. So, you could say the original recipe inspired mine, but mine’s slightly healthier and much tastier (IMO). I swapped out mayo (all kinds) and used fat free plain Greek yogurt. I added scallions directly into the mix and determined the exact amount of honey mustard that complements the yogurt’s tangy-ness. Here’s my final recipe…our “Keeper” version. STEP 1: Preheat oven to 375℉. Line sheet pan with aluminum foil. Spray foil with cooking spray. STEP 2: Place chicken breasts in baking pan. Drizzle each breast with 1/2 teaspoon of olive oil, and season well with salt and pepper. STEP 3: Bake for 25-35 or until the temperature reads 160℉ on a meat thermometer. Remove from oven and set aside to cool. STEP 4: Once chicken is cool enough to handle, chop or shred into bite-sized pieces. Transfer chicken into a large bowl and add the diced pepper and scallions. STEP 5: In a small bowl, combine the yogurt, honey mustard, curry powder, 1/4 teaspoon kosher salt and 2 teaspoons of water; whisk well. 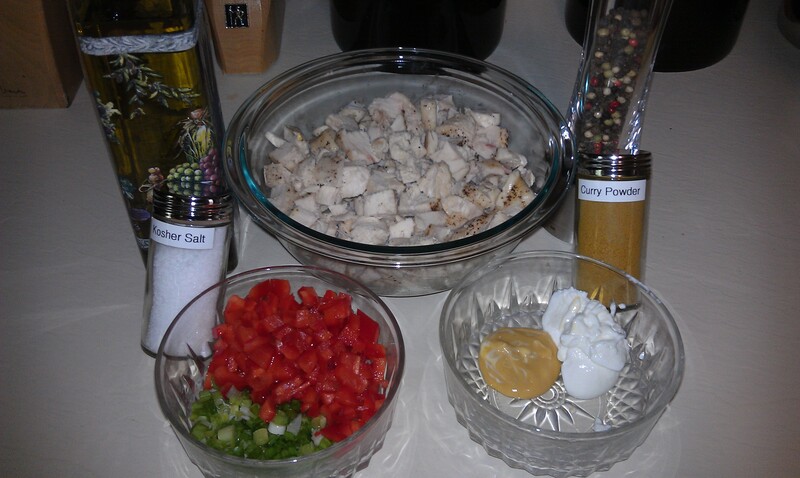 Add dressing to chicken and peppers and mix gently to combine. STEP 6: Divide chicken mixture evenly into each lettuce cup. I know I should have a picture of it in an actual lettuce cup. 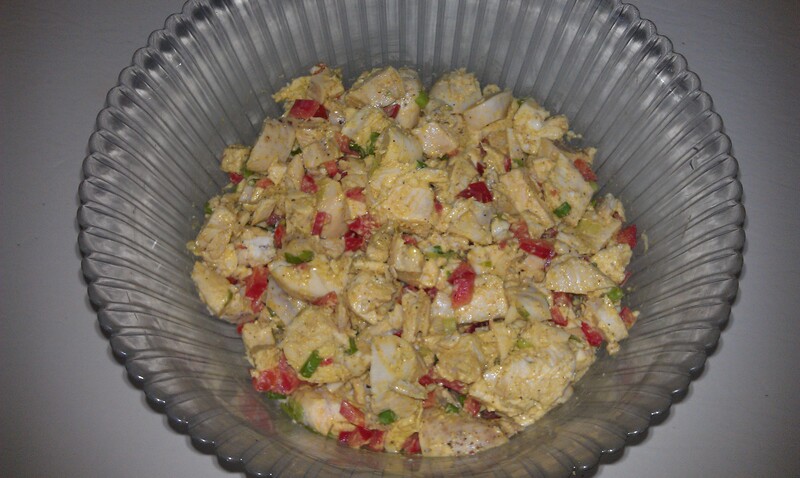 I’ll get it soon, but here’s what the chicken salad by itself looks like when it’s done. This is a spicy-tasty versus spicy-hot curry recipe. If you want heat, add more curry and reduce the honey mustard. If you prefer mayo, use it instead of the yogurt. If you prefer regular onions to scallions, by all means, use them. It’s such a simple recipe that you can easily make substitutions to fit your preferences. It’s tasty, healthy, and best of all – incredibly easy! Give it a try and let me know what you think.